I have a 1927 Fordor. The tail light center (socket)is missing. How do I replace this socket and wire it correctly? Where do I find the correct socket? What parts do I need? Thanks. Depends on whether you have the standard 26-27 tailight or whether you have the accessory (Hall manufactured) stoplight. It can be recognised by its diameter(about the size of a tuna can; the lens rim was originally nickel plated; the lens had a plate on the inside that showed the word stop when the brake was applied; and the lens was cast in red glass with a separate clear license lense glass. If you have the standard tailight, it is much smaller in diameter; the lens was cup shaped, and used a piece of red cellulite to change the lens color from clear to red. Dan, if it is like mine you have two positive wires going into a socket. One is the running light and the other is the stop light. The socket is similar to the headlight sockets. However, the running light connection is spring loaded outward (spreads). My socket spring was gone and I had to fabricate one. I used a spring from a ink pen and soldered the ends on it. It wasn't a easy job, very limited space to work in but after several attempts it was fixed. I did try to find a new socket that would work but had no luck. The people I talked to at Lang's couldn't grasp the setup. That may have been my fault as I tend to be a lousy communicator. They finally gave up and asked me to send pictures of the tail light socket. I decided to repair what I had. I'm pretty sure a regular 2 contact socket can be made to work if one is patient enough to do some tight squeeze cobbling. Mr. Booth, Thank you for your help. I have the small round clear light. The light socket seems to be permanently attached. It seems like it might be difficult to replace without modifying it. If you needed to replace the socket on the small round light, it seems to need quite a bit of work. Is there a replacement socket available that you know of? 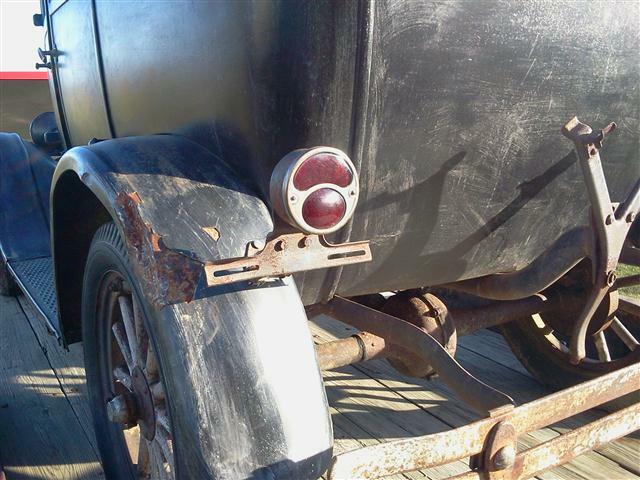 Check out the 28-29 Model A lights available. You might find one that will work for you if you are not too fussy. Bert's Model A in Denver is pretty close by and would be a good source for a LOOK-SEE. If Dan has the smaller taillight and doesn't want to change lights, the wiring would be per the standard Ford wiring diagram. I don't have one ready to post, but I'm sure Dan Trease does. Dan can post anything on any subject. By the way, the standard Ford taillight can be made to operate as a stoplight, also. I forgot how we did it, but my Dad and I wired it to work. The correct small tailights are everywhere. I would get another one. Apparently Ford issued another after the end of Model T production, and it has a straight through socket, enabling the owner to use either a one or two contact socket. I like that type, because I can use a stock tailight, and have a stoplight too. I have two '25s with this setup, and like it. The double spring loaded sockets are easy to find. 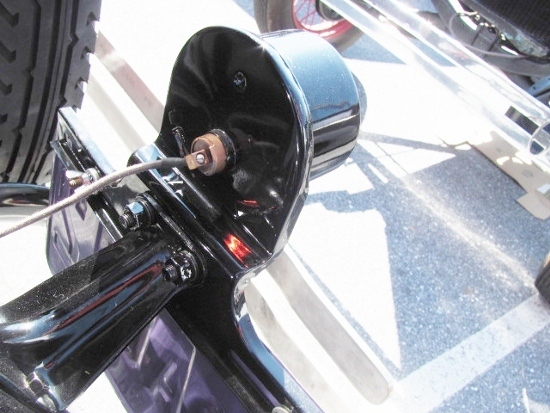 The parts vendors don't offer the correct socket for the '24-'27 glass cup style tail lamp. The correct is a single contact, pin type, and on the end, a spring loaded post to engage the metal tipped tail lamp positive wire. 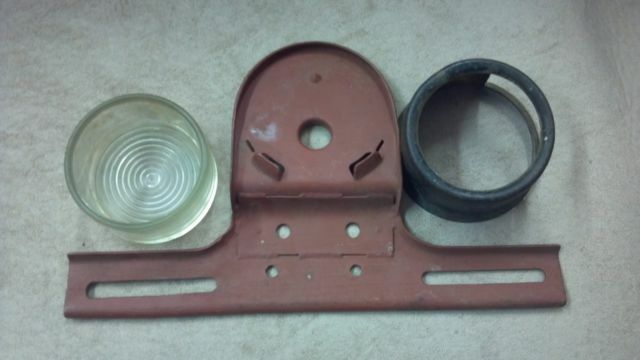 The lamp body is grounded to the frame thru the lamp/license bracket. Correct socket and metal tipped wire locked in the socket end. So your choice, if you can't find a NORS or used socket of this type at swap meets, is to use a new female sockets of the pin type on both ends, they can be had from the parts vendors. That will require you use a Bakelite male plug on the tail lamp wire. But, you could also use a double socket one too, these sockets just press into the metal tail lamp housing, that way you could use a dual filament lamp for a stop light too. Typical Bakelite male socket used, these are correct for the late '26-'27 Stop/tail lamp anyway, and period correct for the earlier elec tail lamps or aftermarket lamps. I have done many different things to repair and/or modify tail lamps. My '24 coupe has two proper vintage original Ford tail lamps, both modified to two filament bulbs for both brake and tail lights. I pressed original two filament guts out of odd headlamps and used original headlamp two-pin connectors. 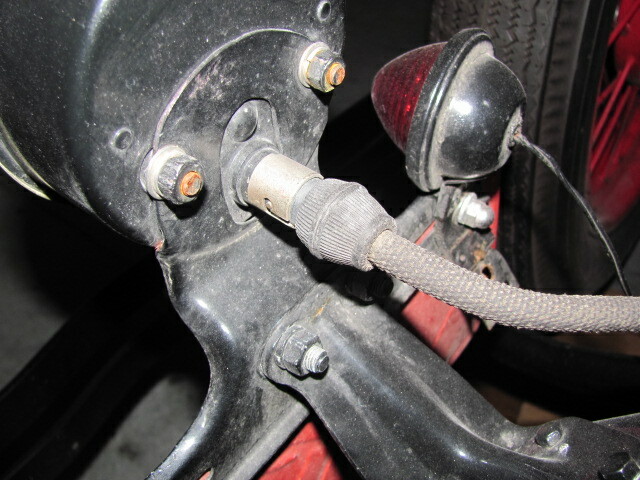 On other tail or brake lamps, I have used modern replacement sockets from the local then Kragens auto supply. Sometimes using the whole socket. Sometimes only the internal parts. A little solder, a little J B Weld. A good lamp. If you are not real particular about being correct, and need a two pin socket. 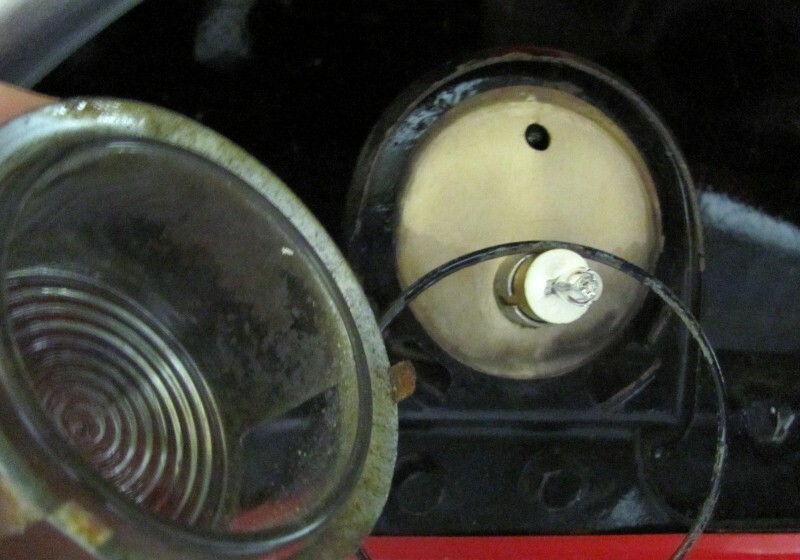 A model T replacement headlamp socket can be easily bolted into a tail lamp using the sockets adjustment screw tab to bolt it in with. You do have to drill a hole to line up with the tab. And those sockets are a bit long. For many tail lamps, the tab may have to be on the outside, and you may have to space it back a bit for the bulb to have room. You also need to have the proper connector for it. But I did that once, and it worked quite well. I would like to add, when I use a double filament bulb in the setup I mentioned above, I get the bulbs from Snyders. Unfortunately, they have a staggered pin configuration, so I have to file off one pin, but it works. They are made for their cowlight turn signal conversion. I did just the opposite of what Larry did. I filed the notch in the socket to fit the staggered pin! 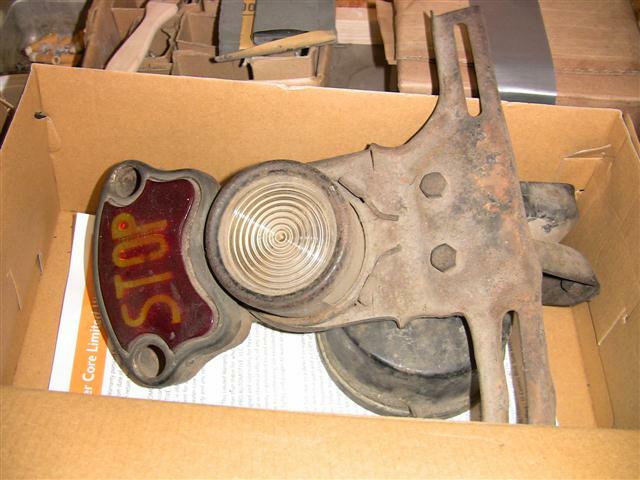 What is the part number or where can I get a correct bulb for my '26? I bought one for the taillight and it is about a 1/8" to long and the glass cover lens will not fit. 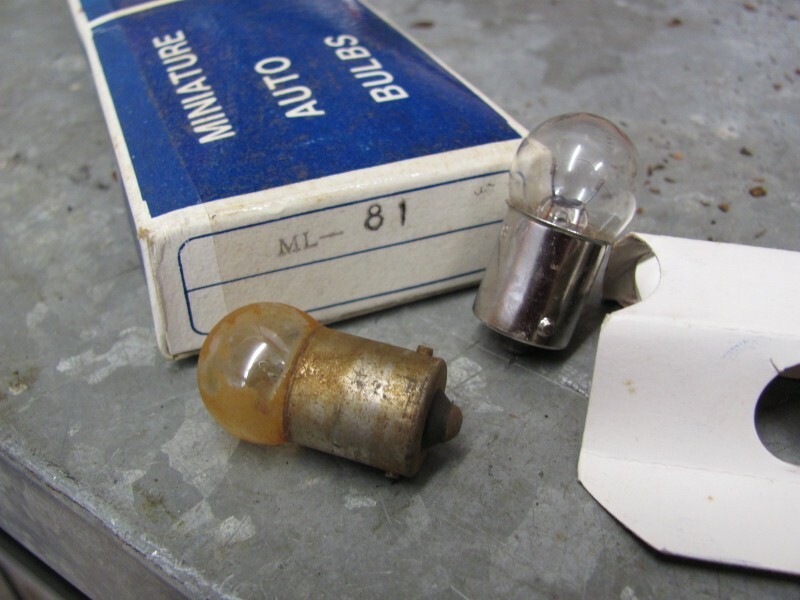 The std #63 is a 6v 3c/p (0.63amp) bulb, fits the tea cup style tail lamp, what was used back then. But is rather dim. The next up is #81, that is 6v 6c/p (1.05amp) and is better. The best is the hybrid Halogen, which are potted in a single contact pin base, these are 6v but put out 20watts. Bright. Get these from vendors, like Langs, about $13 ea but worth the brightness.